No teams has better stock to offer for Kovalchuk than Philadelphia. If the Thrashers can land Jeff Carter and literally, nearly anybody else from the Flyers organization, Atlanta scores a major victory! Consider that Carter is only 25 years old, is fantastic defensively, deadly on the PK and scored 46 goals last season and comes at a very reasonable cap number. Carter does not have a no-movement clause to worry about, and with his addition there is no reason to push for a top level defenseman and a pick/prospect in addition. 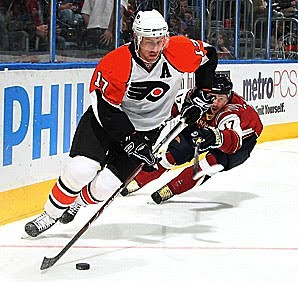 Philly has expressed interest in Kovalchuk. If we were Don Waddell, we would be fixated on making a Carter deal happen. The firing of Ken Hitchcock in Columbus was long overdue. Hitch was a victim of his own success with the Jackets. His disciplined style pushed Columbus into the playoffs last season for the first time. If seems that his plays then looked back at last season and believed that they were responsible for their good run and tuned the good ol' coach out from the onset. 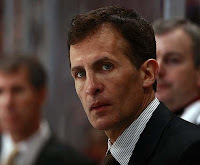 A guy like Tony Granato might be a great fit for this young team. he would be demanding of the players, but without the generation gap. i.e. Nikita Filatov would get a chance to learn from his mistakes while playing with the top six. We made Russia our early favorite to win gold in Vancouver after looking at their "Murderers Row" top two lines. However, at second glance Canada just has too much depth to favor anyone else. Defending gold medalists Sweden without the Mule or the very vocal Mikael Samuelsson have to be expected to drop a few notches. The US wasn't going to win with Komisarek and Martin, let alone without them. 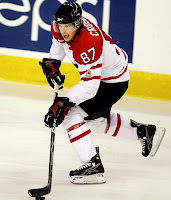 Crosby will cross another thing on his to-do list this year. Hockey Plumber says that J.S. Giguere will be waaaay more popular in Toronto than Dion Phaneuf this time next year. The Carolina Hurricanes will sell some pieces off at the deadline and be better off for it next year. Dallas will try to make major moves too, but will do more damage than good. I've read a lot of reports that they have been dangling some of their young talent (Benn, Fistric and Neal) looking for some other team's puck moving defensemen. They will be sorry giving up on any of their own guys. Anytime Glen Sather does something smart... like dumping Gomez and turning his salary slot into Marian Gaborik... he is bound to make at least two really bad moves. Watch for Slats to at least try to give away some of his young talent for a quick "fix" at the deadline.